2013-14 training camp in October 2013. ONTARIO, CA — While the National Hockey League is off the ice during the XXII Olympic Winter Games in Sochi, Russia, other North American leagues are still on the ice, including the ECHL, where Los Angeles Kings left wing prospect Maxim Kitsyn is working to hone his skills. Almost four years ago, Kitsyn, a native of Novokuznetsk, Russia who was 18 years of age at the time, came to Los Angeles for the 2010 National Hockey League Entry Draft, held at Staples Center. He was selected by the Kings in the sixth round (158th overall). Back then, Kitsyn was already playing in Russia’s Kontinental Hockey League, and aside from a 32-game stint in the 2010-11 season with the Mississauga St. Michael’s Majors of the Ontario Hockey League, he remained in the KHL. As a result, for many NHL followers, he was out of sight, out of mind. He became a mostly forgotten Kings prospect. 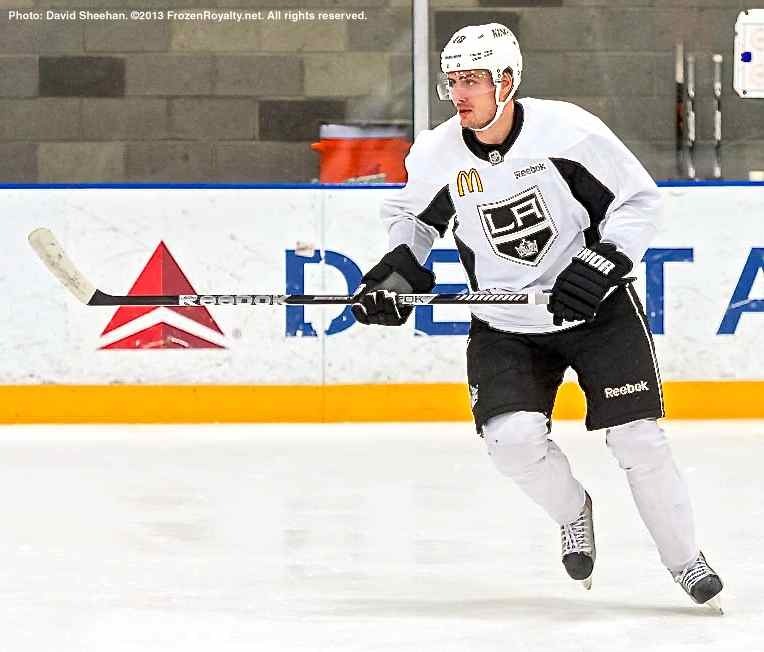 But this season, the 6-2, 192-pound left wing arrived in Los Angeles for the Kings’ 2013-14 training camp. He did not make the big club’s roster, and was assigned to their primary minor league affiliate, the Manchester Monarchs of the American Hockey League. Kitsyn struggled with the Monarchs, playing in just twenty games this season, scoring three goals and adding an assist for four points, with a -2 plus/minus rating and two penalty minutes. 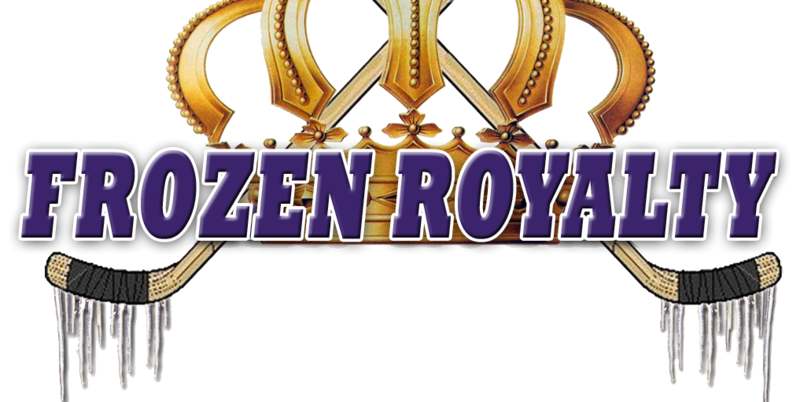 Unable to crack the Monarchs’ lineup on a consistent basis, Kitsyn was assigned to the Ontario Reign of the ECHL on January 23, 2014. In thirteen games with the Reign, he has scored four goals and has contributed seven assists for eleven points, with a +4 plus/minus rating, and seven penalty minutes—respectable numbers. Kitsyn, who has been playing on right wing with the Reign, appears to have been a good addition to the Reign, even though, like virtually all young prospects, there is a lot of room for improvement. Reign assistant coach Mark Hardy, a former Kings defenseman and assistant coach, indicated that Kitsyn is not all that different from so many young European or Russian players who are accustomed to playing on the larger international ice surface. Kitsyn does not seem to be buying Hardy’s contention that the North American game is quicker and faster than it is in the KHL. Like so many young players, no matter where they’re from, Kitsyn’s defensive play needs some work. Although Kitsyn is not a slow, plodding skater, skating is something the coaches want him to work on. Hardy noted that Kitsyn needs to learn how to play smarter to conserve energy. Kitsyn said that concentration was even more important in the ECHL than it was in the AHL. On February 16, Kitsyn scored the game-winning goal in a 4-2 victory over the Alaska Aces at Citizens Business Bank Arena in Ontario. After being tripped behind the Alaska net, and while he was flat on his stomach, Kitsyn swept the puck towards the net, and it deflected in. But on the flip side, although Kitsyn apparently had the trust of the coaching staff to be on the ice during the final minute of the game with his team leading by two, he tried to score from the Ontario zone into the empty Alaska net three times. But he missed each time, resulting in icing calls and a face-off in the Reign zone with tired players stuck on the ice. His coaches were not pleased. Conditioning was a question mark for Kitsyn entering this season, after he scored poorly on at least one conditioning test during the Kings’ training camp last October. The tough schedule in the ECHL will be a good test of Kitsyn’s level of conditioning. But Hardy indicated that Kitsyn is in good shape now. After not getting much ice time with the Monarchs, Kitsyn appears to have the right attitude about playing in the ECHL with the Reign.